Welcome to my last “gift guide” for this holiday season! You can check out my 25+ Gift Ideas to Expand Speech Skills post and Stocking Stuffer Ideas to Expand Speech Skills post for more ideas. When I was finished with my 25+ Gift Ideas post, I realized I had not included GAMES! 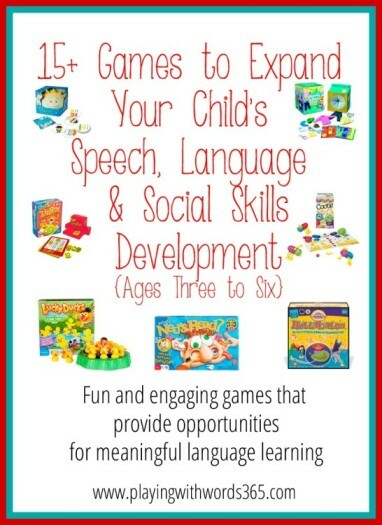 I use a lot of games in my therapy, as do many pediatric speech pathologists. 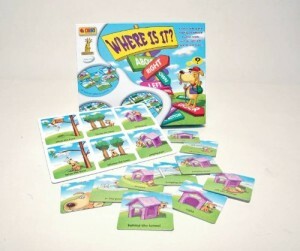 I often adapt traditional board games to fit the needs of my client’s/student’s needs, however there are some games that are fantastic for speech, language and social skills development just as they are and are great gifts for little ones! This post contains affiliate links to Amazon for your Convenience. Two companies I love for educational games for 3-6 year olds are Thinkfun and Educational Insights . 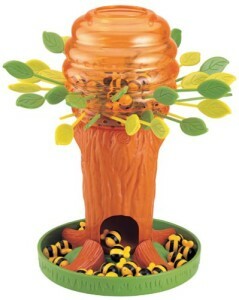 I also love games by Blue Orange Games , especially for social skills building and story telling (in older children). I’ve created two lists here for you. 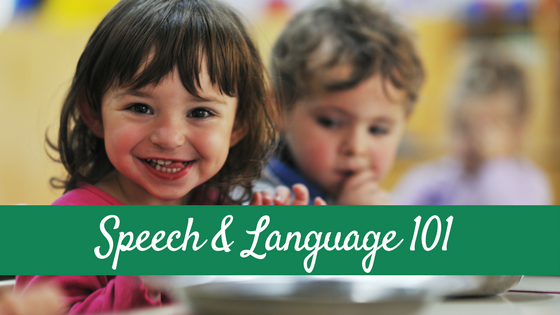 The first list is compromised of simple preschool games that are NOT language heavy. I use these games in therapy for three purposes: 1) To introduce young children to the concepts of simple games, 2) To teach and build social-cognitive skills like turn taking and joint attention (particularly in children with social cognitive delays- autism, ADHD and sensory processing disorder, among others) and 3) as a reinforcing activity while I teach other speech/language skills (i.e. working on producing speech sounds). These games do not require a ton of language just on their own, which makes them great for targeting other skills while having fun. 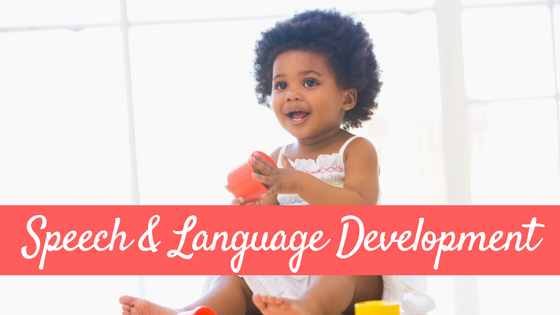 My second list is made up of games that are more language-heavy and therefore are great for speech & language development right out of the box. These are all games I have used in the past or currently own myself. Here they are, in no particular order! These games can be used to teach and reinforce turn taking, joint attention, eye contact and non-verbal communication while introducing young children to the concept of table games. Like I explained, these games require little language but can be used to teach some basic vocabulary as well. This is a huge favorite in my therapy. 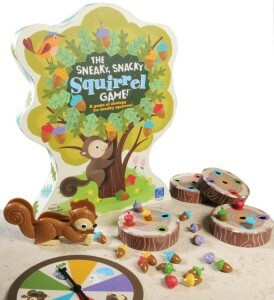 The Sneaky, Snacky Squirrel Game is fun! Use the squirrel tongs to grab the acorns. First player to get all the acorns wins! One note about this game: Using the squirrel tongs can be difficult for children with fine motor delays so I often allow these children to use their fingers in addition to the squirrel tongs if needed. is fun! Use the squirrel tongs to grab the acorns. First player to get all the acorns wins! One note about this game: Using the squirrel tongs can be difficult for children with fine motor delays so I often allow these children to use their fingers in addition to the squirrel tongs if needed. This is a huge staple in my therapy. 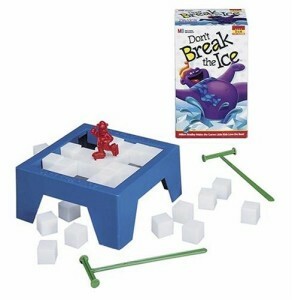 I use Don’t Break the Ice a LOT to teach turn taking skills in young children. In addition, I will use this game as a reinforcer when working on other skills in therapy by having the children “earn” pieces of ice that they use to set up the game and then when we earn all our ice and the game is set up, we play! This is also a great game to use to help teach children to control their impulses and WAIT as is very tempting for young children to want to smack the ice with their hammer while waiting their turn. a LOT to teach turn taking skills in young children. In addition, I will use this game as a reinforcer when working on other skills in therapy by having the children “earn” pieces of ice that they use to set up the game and then when we earn all our ice and the game is set up, we play! This is also a great game to use to help teach children to control their impulses and WAIT as is very tempting for young children to want to smack the ice with their hammer while waiting their turn. 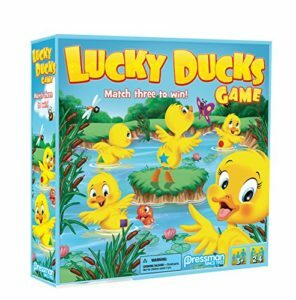 This is a game I use a lot with little ones to help teach the basic turn taking skills needed to play games as Lucky Ducks is a fairly simple matching game and children are usually motivated by the moving ducks. Another very popular game in my therapy! In Honey Bee Tree , players remove the leaves one-by-one trying not to have any bees fall (or as I play it, see just how many bees DO fall!). When using this as a reinforcer in my therapy, I’ll have the children earn leaves and insert them as we work on other skills and then we play the game ones it is all set up. Kids seriously LOVE this game. , players remove the leaves one-by-one trying not to have any bees fall (or as I play it, see just how many bees DO fall!). When using this as a reinforcer in my therapy, I’ll have the children earn leaves and insert them as we work on other skills and then we play the game ones it is all set up. Kids seriously LOVE this game. 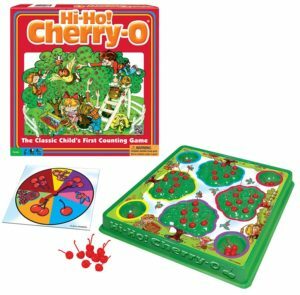 Hi Ho Cherry-O is a pretty popular preschool game. The concept is very similar to the Sneaky Squirrel game in that the first to get all your cherries in your basket is the winner. Great for turn taking, counting, color ID, and even early addition and subtraction concepts. I’m not sure there in an SLP who doesn’t use this one! Pop-Up Pirate Game is SO motivating and fun! The pirate is pushed into the barrel and the kids take turns putting the swords in the bucket until POP goes the pirate! is SO motivating and fun! 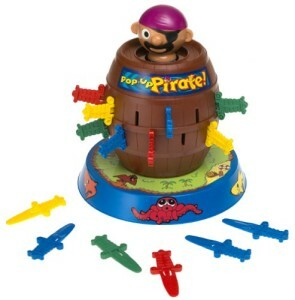 The pirate is pushed into the barrel and the kids take turns putting the swords in the bucket until POP goes the pirate! 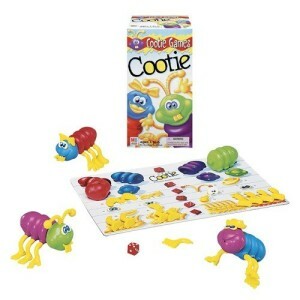 A classic preschool game, Cootie is great for turn taking, body part vocabulary and fine motor skills. In fact, for children with fine motor delay this game can be a little challenging so you may need to help these kids build their cooties. 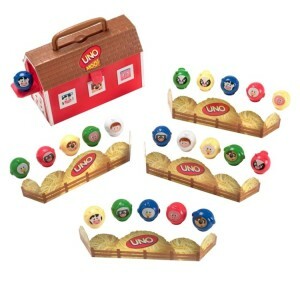 A take on the classic UNO game, designed for the preschool set, UNO MOO Preschool Game is great for turn taking, vocabulary, color ID, matching skills, following directions, and more! And I LOVE how the game packs up in itself and has a handle for easy storage and portability! 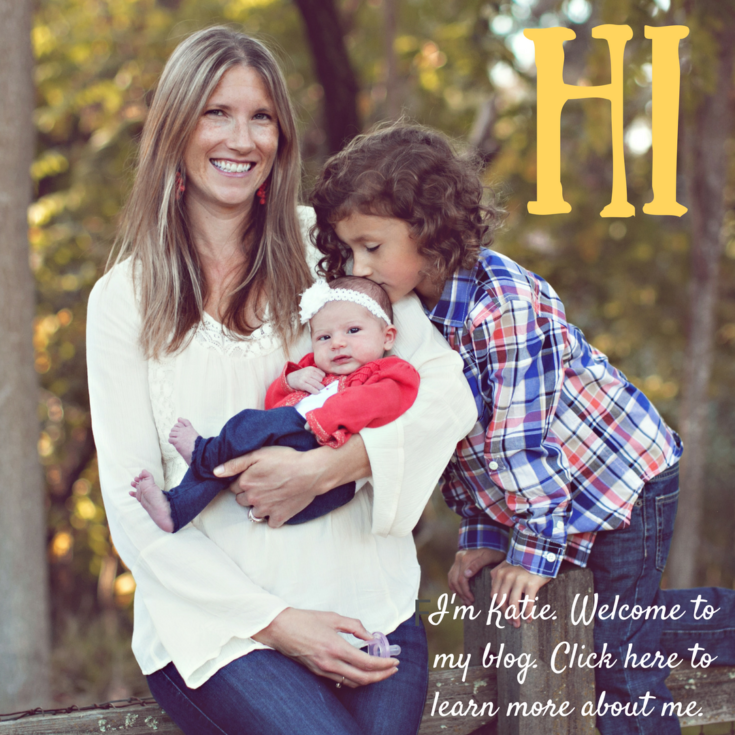 is great for turn taking, vocabulary, color ID, matching skills, following directions, and more! And I LOVE how the game packs up in itself and has a handle for easy storage and portability! This is one of my top 5 favorite games for therapy. 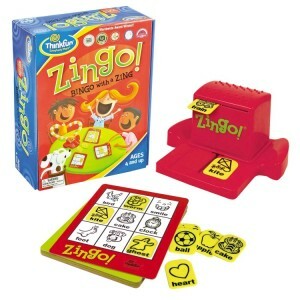 ThinkFun’s Zingo is fantastic for turn taking and vocabulary building. Add in some commentary about the pictured items and you have hours of fun language building in one little game. Kids LOVE IT! is fantastic for turn taking and vocabulary building. Add in some commentary about the pictured items and you have hours of fun language building in one little game. Kids LOVE IT! 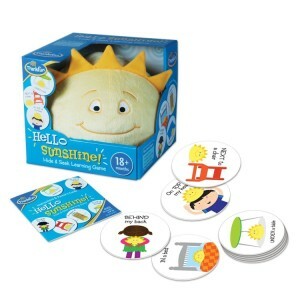 Wonderful for teaching locative concepts, Hello Sunshine Game is a FUN active game where you take turns hiding Sunshine (a plush sun) in different places while learning about locative concepts. I LOVE games like these that get kids moving (not just sitting in one place) and help teach skills in a playful and meaningful way. Though targeted for 18 months and up, it can be see for any young child with speech and language delays as well. is a FUN active game where you take turns hiding Sunshine (a plush sun) in different places while learning about locative concepts. I LOVE games like these that get kids moving (not just sitting in one place) and help teach skills in a playful and meaningful way. 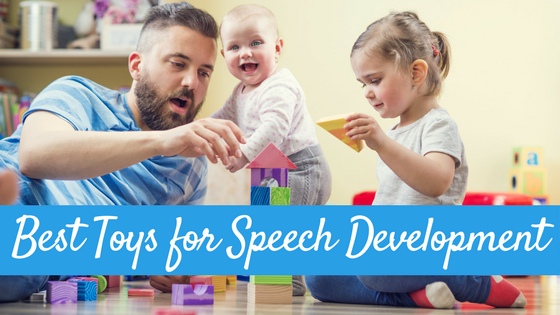 Though targeted for 18 months and up, it can be see for any young child with speech and language delays as well. 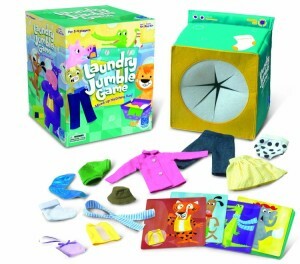 Great for Clothing ID, Matching and more Laundry Jumble Game is very similar to What’s in Ned’s Head (below) in that it uses a multi sensory approach to play (feel) and is a bit more appropriate for the little ones who may not like the grossness of Ned’s Head. 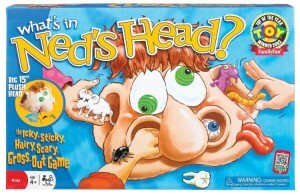 is very similar to What’s in Ned’s Head (below) in that it uses a multi sensory approach to play (feel) and is a bit more appropriate for the little ones who may not like the grossness of Ned’s Head. If you haven’t tried this game, I totally recommend it for ages 4 and up. The Cat in the Hat I Can Do That! Game is another game that gets kids moving and learning in fun and meaningful ways. Get silly while working on memory, following directions, vocabulary social skills and turn taking! is another game that gets kids moving and learning in fun and meaningful ways. Get silly while working on memory, following directions, vocabulary social skills and turn taking! Another hit by the folks at Dr. Seuss is the Dr. Seuss What’s in the Cat’s Hat? Game . 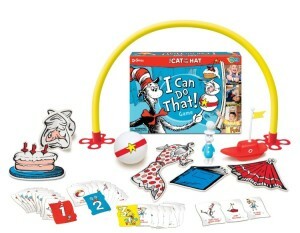 In this game, you’ll be having a blast working on answering and asking questions, building memory and recall, turn taking, following directions and deductive reasoning as you take turns hiding household items in the Cat’s Hat as players ask questions and explore the object in various ways to figure out What’s in the Cat’s Hat!? . 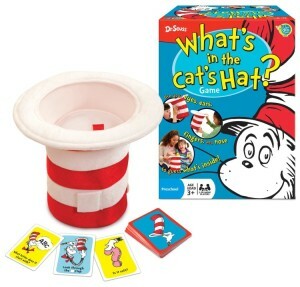 In this game, you’ll be having a blast working on answering and asking questions, building memory and recall, turn taking, following directions and deductive reasoning as you take turns hiding household items in the Cat’s Hat as players ask questions and explore the object in various ways to figure out What’s in the Cat’s Hat!? 14. What’s In Ned’s Head? This is another in my top 5 most used games in speech therapy. What’s In Ned’s Head is, well, a little gross but the kids LOVE it. Take turns reaching into Ned’s Head where he has a bunch of weird and sometimes disgusting items up in there. Reach in Ned’s Head though his ears or..his NOSE! Feel with your hands…can you tell what it is? A rat? A brain? A TONGUE?? So much fun and great for deductive reasoning, vocabulary development, and social-cogntive skills like joint attention and turn taking. Did I mention it’s a little gross? You can always throw in items from your own home that are not quite so yucky! is, well, a little gross but the kids LOVE it. Take turns reaching into Ned’s Head where he has a bunch of weird and sometimes disgusting items up in there. Reach in Ned’s Head though his ears or..his NOSE! Feel with your hands…can you tell what it is? A rat? A brain? A TONGUE?? So much fun and great for deductive reasoning, vocabulary development, and social-cogntive skills like joint attention and turn taking. Did I mention it’s a little gross? You can always throw in items from your own home that are not quite so yucky! This is a great game for learning locative concepts. The Where Is It? Game is kind of like Bingo but with images of a silly dog in all kinds of places. Where is he? On top of the house? Near? far? Running around the house? 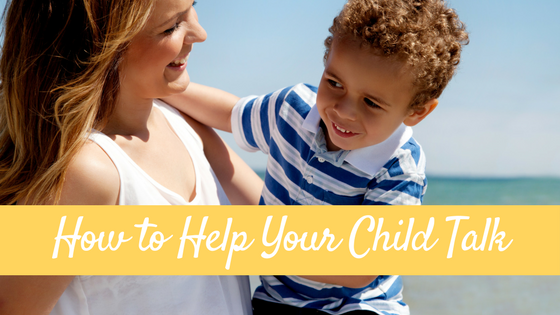 I use this a lot with little ones who are struggling with these concepts. is kind of like Bingo but with images of a silly dog in all kinds of places. Where is he? On top of the house? Near? far? Running around the house? I use this a lot with little ones who are struggling with these concepts. OK, here are two bonus games: I have NOT played these, but have come recommended to me for various reasons so i thought I’d share them with you. They are on my wish list! This game ALWAYS pops up in my Amazon searches as related to other games I like. 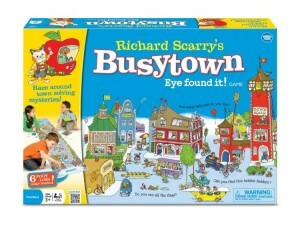 I’ve heard it is a ton of fun and with a 5 star rating on Amazon out of 292 reviews, I’d say Richard Scarry Busy Town Game is probably a winner. From what I have read, it seems like it would provide many speech, language and social skill learning opportunities as well. is probably a winner. From what I have read, it seems like it would provide many speech, language and social skill learning opportunities as well. 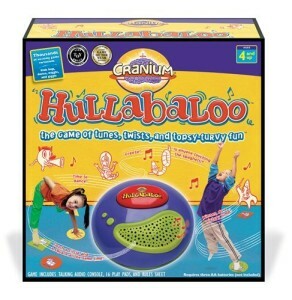 I have had several parents recommend Cranium Hullabaloo to me before. It is supposed to be loads of fun and great for working on following directions. I’ve been thinking about getting this one for my own kids. to me before. It is supposed to be loads of fun and great for working on following directions. I’ve been thinking about getting this one for my own kids. Now it’s your turn, what are YOUR favorite games for 3-6 year olds? Looking for more gift ideas? 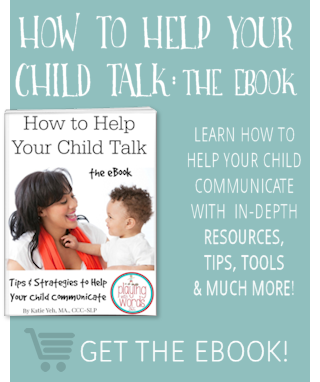 Be sure to check out my 25+ Gift Ideas to Expand Speech Skills post and Stocking Stuffer Ideas to Expand Speech Skills post! Where did you get the Where is It? game….can’t find it anywhere. Any help would be appreciated. thanks! This is a really good list, thanks for this.